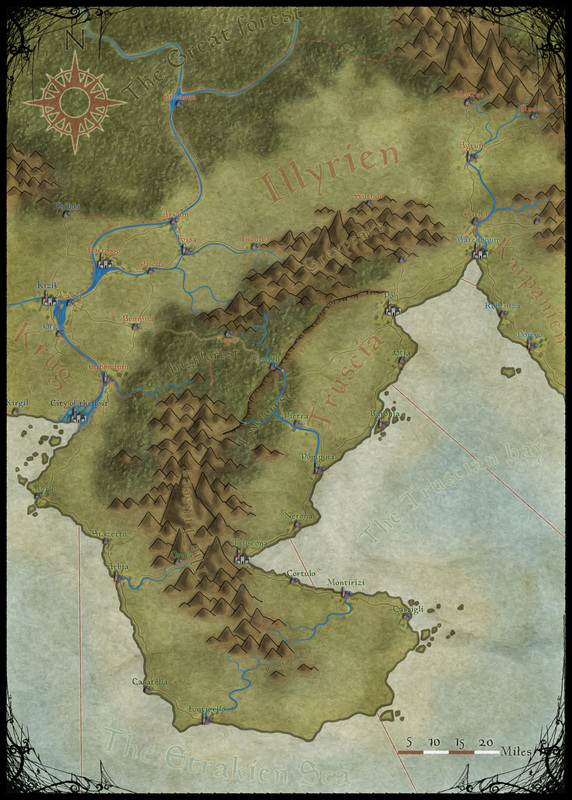 This entry was posted in Maps and tagged Etrakien, Photoshop, Region map by clercon. Bookmark the permalink. Very beautiful. One thing though, the western river is sort of unnatural (the “circular” part). If you look closely on the part of the river between Fossa and Arvum you can see that the “river” is painted a bit different. That is because it is a man made canal. Did you draw the whole map in Photoshop? Would you recommend doing that to someone who is just starting out (I have only drawn my maps on paper using pen, pencil, and colorful markers), or using something like CC3? I am really attracted to topographic-looking maps like the map for Dragon Age 2, but I wouldn’t even know which software to use for that. The map is completely done in Photoshop, but with a wacom tablet. If you decide on going the Photoshop road here I really recommend getting a tablet. If you want to draw mountains, coastline, city icons etc you really need a pen. Doing that with a mouse is next to impossible, or at least it will take you a lot more time. If you should go with Photoshop or CC3 is hard to say. It depends a bit on your skill when it comes to drawing. CC3 might also be easier in the start, I started with CC3 (that I still use a lot wen I make cities) and then moved on to Photoshop. The good thing with CC3 is that you have style packs in it that includes all the elements you need for your map like mountains, city icons, hills etc. If you are interested to do maps in this particular style I’m actually working with Profantasy at the moment to turn this map into a style that you can use in CC3. The style will be released in this years Annuals December issue.